Join us and the Jane Addams Hull-House Museum in welcoming Michelle Duster, great-granddaughter of Ida B. Wells-Barnett to UIC. Book signing and discussion on “Ida in her Own Words” and “Ida from Abroad”, written by Michelle Duster & Troy Duster. Michelle Duster compares her life experiences to those of her great-grandmother and highlights the challenges and progress of African American women born a century apart. Troy Duster adds historical background to the reason why global pressure was solicited in order to address the wide-spread oppression and terrorism faced by African Americans at the turn of the 20th century. 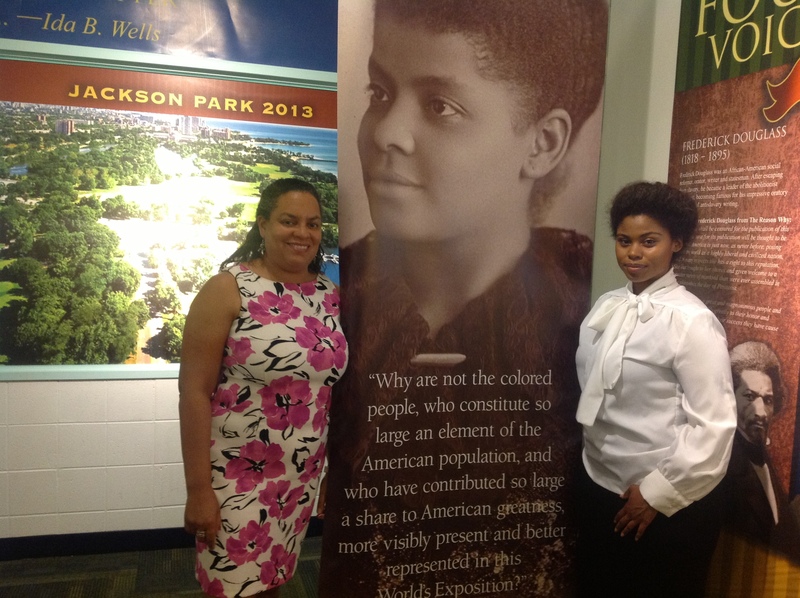 Michelle Duster, great-granddaughter of Ida B. Wells-Barnett and Keesha Merritt, our Ida B. Wells Interpreter and Actress. Photo was taken during our last week’s even Happy Birthday IDA! This entry was posted in AACC news, World's Columbian Exposition of 1893 and tagged African American History, African-American, Hull House, Ida, Ida B Wells-Barnett, Ida B. Wells, Jane Addams Hull, Michelle Duster, Troy Duster, UIC, United States. Bookmark the permalink.